Earlier this month, an 85 year old man was spotted travelling down the hard shoulder of the M1 in South Yorkshire near Sheffield on his mobility scooter, apparently completely oblivious to the fact that what he was doing was not only unsafe, but also illegal under UK law. Despite the fact that the average life expectancy in the country is steadily growing, with the Office of National Statistics showing a 78.7 year life expectancy for men, and a 82.6 year life expectancy for women, it appears that, as a nation, we’re refusing to slow down. It is widely believed that advanced technologies and easy access to mobility aids and assisted living devices are giving a new lease of life to the elderly, allowing them to live a full, active, and sometimes dangerous lifestyle, if this recent news is anything to go by. The man in question, who has remained unnamed but is believed to be a Yorkshire resident, was escorted from the motorway by police after a number of drivers had alerted authorities that the gentleman’s safety was at risk. Lorry driver Steve Saxon was one fellow who saw the event unravel before his very eyes, stating that “I don’t know what he was thinking or where he thought he was going but it’s the most bizarre thing I’ve seen in almost 20 years driving lorries”. While the elderly gentleman may have felt empowered by his mobility scooter, he, like the rest of the 300,000 mobility scooter users in the UK, needs to adhere to the current legislation surrounding the use of mobility devices in public spaces, including on pavements and on roads. Mobility devices of this sort can be broken down into 3 categories – class 1 (manually operated devices), class 2 (powered devices with top speeds of 4 miles per hour, designed for pavement use), and class 3 (powered devices with top speeds of 8 miles per hour, designed for road use). Regardless of the class of device being used, users must adhere to the law that was introduced in 2007, following a spate of accidents attributed to negligent mobility device use. So where did this elderly Yorkshireman go wrong? There are two areas that stand out. Firstly, the current legislation is very clear that mobility scooters and motorised wheelchairs must not, under any circumstances, be used on motorways. Secondly, the government states that ‘when you are on the road, you should obey the guidance and rules for other vehicles‘ which means that had the scooter been approved for motorway use, it should not have been travelling along the hard shoulder. One aspect that is in the gentleman’s favour, however, is the law stating that mobility devices must not be used on roads where the speed limit is greater than 50 miles per hour. On the day the man was spotted driving along the M1, roadworks had forced the speed limit on the motorway down from 70 miles per hour to 50 miles per hour – perhaps he thought this restricted speed limit allowed him to use his scooter on the road. Another way of looking at the event is that the gentleman wasn’t confused about legislation at all, and was instead flaunting his new lease of life, perhaps attempting to emulate Colin Furze who made headlines back in 2010 when he broke the Guinness World Record for fastest mobility scooter, travelling on Bedfordshire’s Santa Pod Raceway at a top speed of 71.59 miles per hour. Of course, this was no ordinary mobility scooter, having been adapted to include a petrol-powered motorbike engine which fitted snugly underneath the seat. Mobility devices are often seen as methods of simply improving quality of life to a point where it is safe and manageable for an elderly or disabled person to live in their homes, but the UK is one country that is really striving to make them much more than that – they should improve quality of life even further, boosting confidence and independence to make life enjoyable, and, in some cases, to give a new lease of life altogether. 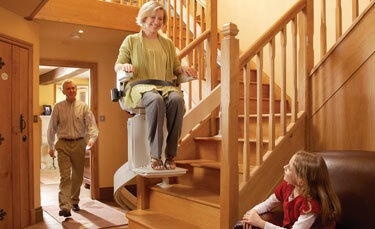 Consumer Focus reports that 81 percent of people believe mobility devices such as wheelchairs, stairlifts, and hoists have the potential to improve quality of life, making it easier for the elderly and disabled to live as normal a life as possible, which includes moving about their home freely, carrying out regular everyday tasks, and getting outdoors and socialising with friends and family. Unfortunately, while the UK is showing how mobility aids can make a massive difference, other countries aren’t quite so forward thinking. It was only last year when a US-based mobility aid supplier landed in hot water for screening TV adverts showing older people in mobility scooters out sightseeing, fishing, and bonding with their grandchildren at baseball games. Had this been screened in the UK, the nation would have undoubtedly praised the supplier for demonstrating how these devices can improve lives. In the United States, however, it was criticised for glorifying restricted mobility. Dr Barbara Messinger-Rapport, a doctor specialising in geriatric medicine at the Cleveland Clinic, stated that the advert was irresponsible for implying that “you can use these scooters to leave the house, to socialise, to get to bingo”. This is exactly what mobility aids are for – to bring back a sense of normality, and to encourage socialisation amongst the elderly. A healthy social life is one of the best medicines during old age, and it can even be as beneficial to health as exercise, according to one study in the British Medical Journal that claims that ‘social and productive activities that involve little or no enhancement of fitness lower the risk of all cause mortality as much as fitness activities do’. A further study found that the elderly can lower their risk of the need for residential or long term hospital care by nearly 50 percent by participating in social activities. The effects of mobility aids should never be underestimated. They can offer so much more than simply allowing a person to get out of bed without assistance – they can give you so much confidence that you want to drive your mobility scooter down the M1 in Sheffield… although that’s certainly not recommended! This entry was posted in Elderly, Health, OffBeat and tagged life, mobility. Bookmark the permalink.